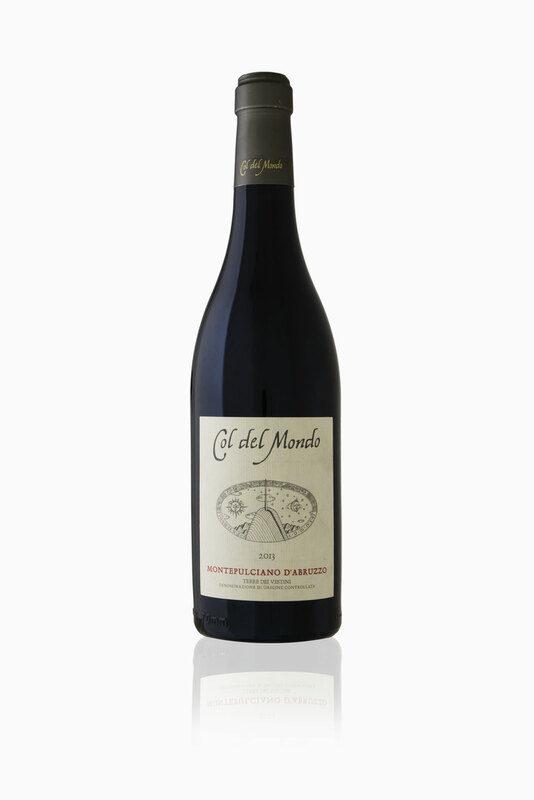 Montepulciano Col del Mondo, is among our wines, the most symbolic and significant, because more representative of the land and the traditions of Abruzzo, of our great commitment and immense passion. When we created our company, we started from the classic grape of Abruzzo, Montepulciano, to make our wines. Our best application was necessary both on a conceptual (the research of essence of Montepulciano) and practical level (the use of new and different in viticultural and oenological technologies at every point of the production process) to achieve a steady quality improvement, always in compliance with the typicality of the wine. The bunches are selected and hand-picked. The grapes are destemmed, crushed and then fermented at controlled temperature (max 28° C), while the maceration lasts 2-3 weeks, depending on the vintage, with frequent pumping over and delestages. Then the wine is transferred into the barrels, where malolactic fermentation takes place at the end of which many batonnages are done. From the spring, the wine rests quiet for 12 months. Wine Appellation: Montepulciano d'Abruzzo D.O.C. " Torre dei Vestini"
Type of soil: White morainic material with silt and clays in one vineyard; clayey and sometime calcareous marl in the second vineyard. Bottling period: during the spring of the second year following the grape harvest.